Sunday Ali is an African Entertainer based in Brisbane Queensland Australia. His show ‘Hello Africa’ is a fresh new interactive entertainment of Drumming and Dance show that undoubtedly will make any of your corporate event feel like they are traveling through Africa using storytelling, sound of drums and dance of Africa. 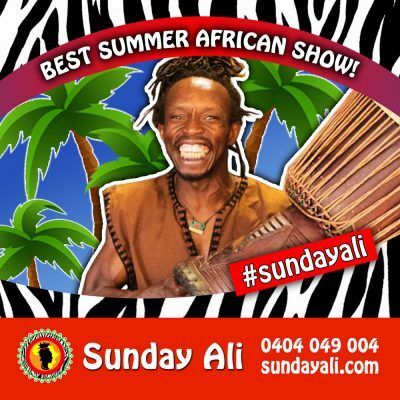 Sunday Ali and his team of African performers have been entertaining for over 20 years to all audience numbers as many as a thousand or more and loves to create amazing memories for every age together at the same time. If you don’t know how to make your event unforgettable whether it is a team building or anything else, certainly contact Sunday Ali direct (no agent!). Because he and his team know how to make your event the best ever time. Finally, our show package is for up to 50 people including all show drums and musical instruments to make our show great. On ordering, you can add additional African drummer and also hire extra drums as needed. Once all is confirmed, you will receive a booking confirmation by email. For any questions, please send us a message on our contact page.